Powers/Abilities: Firebolt possessed the ability to generate plasma energy from his body. He was also resistent to heat and fire. History: (Marvel Super-Heroes III#3/5 (fb) - BTS) - Firebolt was hired by Roxxon Oil to infiltrate Project: PEGASUS by becoming its new security director, and to use his powers to sabotage the facility in order to drive them out of business. (Marvel Super-Heroes III#3/5) - The Project's former security director, the Blue Shield, subjected himself to a test of his force field's ability to resist thermal radiation, but Firebolt sabotaged the experiment, causing the laboratory to burst into flames. Firebolt then played the part of a hero, entering the lab to save the Blue Shield. Dr. Jeannine O'Connell eventually realized that Firebolt was responsible for the acts of sabotage, but Firebolt had realized that she was on to him, and attempted to murder her. However, the Blue Shield came to her defense, as Firebolt confessed that he had been hired by Roxxon Oil. 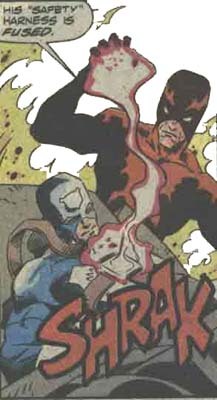 Firebolt tried to kill O'Connell with a blast of plasma, but the Blue Shield tackled Firebolt, throwing off his aim. He then put Firebolt into a hold, and Firebolt attempted to force himself free by unleashing an intense blast of plasma. However, the Blue Shield's force field protected him, and the backlash from the plasma incinerated Firebolt. In the aftermath, the Blue Shield decided to return to Project: PEGASUS as its security director. Comments: Created by Len Kaminski, Greg Capullo and Tim Dzon. His real name was revealed in the Spider-Man Brand-New Day Yearbook in Blue Shield's profile.